On Saturday, August 21, 1999 about 50 descendants and friends of the Thomas/Mary Higgins Dunn family assembled for their annual Dunn Family Reunion at the home of Marie Benoit Wilcox on Citizens Road in Newport, Vermont. James C. Dunn of Kilkenny, Ireland left Liverpool aboard the Ship Ashburton on October 18, 1848 and arrived in New York on October 25, 1848. The following fall on November 1, 1849, his wife Ellen Croak Dunn and their infant daughter Mary, accompanied by Jim's brother Thomas arrived in New York aboard the Ship Ivanhoe. Within the next three years all five of his siblings, Michael John, John, Lawrence, Patrick, and Mary had arrived in the Newport, Vermont area and initially at least settled within the area. There are many records of land dealings between several of the boys and Seymour Lane, one of the earliest settlers of Newport. It was John Dunn, who arrived in Newport in 1852, that was the focus of this years gathering. REMARKS: Substitute for Edward Atherton, ESSEX. Killed in Action May 5, 1864. 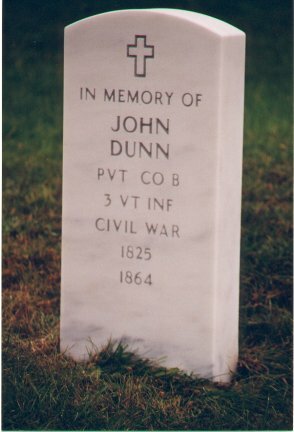 John Dunn, [1825-1864] a granduncle to most of us attending this reunion, was memorialized. John was killed in the Civil War during the Battle of the Wilderness. He was a member of Company B, Third Vermont Regiment and prior to his enlistment had owned property and lived on Dunn Hill in Newport, Vermont. The Third Vermont Regiment was part of Lewis A. Grant's Vermont Brigade of Getty's 2nd Division, VI Corps, Army of the Potomac. The Brigade distinguished itself on 5 May 1864 during the Battle of the Wilderness. In the early development of the battle on the morning of 5 May 1864, Getty was ordered by General Ulysses S. Grant to advance to the junction of Brock Road and Plank Road and "hold it at all costs." Within that week, the Vermont Brigade lost 1,645 out of its 2,800 effectives! It was their hardest fighting, they did hold, and the costs were high. John was killed in this engagement on May 5th, 1864. His body was never recovered and there was never a memorial erected to him. I had found it incredible that a Memorial for John Dunn had never been erected. I also found it unthinkable that no mention of his death was ever published in the local newspapers [to the extent I have searched at least] or any other of the historical records Peggy, Earl and I have browsed through. I inquired of Earl in early April of 1998 if he knew of any historical Veterans programs that might offer some resources in this matter. Earl e-mailed the information directly including telephone numbers, VA Forms etc and within days I had the necessary applications in hand. The heart of the matter is the VA will provide Memorials free of charge to eligible Veterans. I immediately called my Uncle, Howard Dunn, advising him of my plan to secure a Memorial and seeking counsel as to how the necessary funds might be raised to purchase a lot in St Mary's Cemetery in Newport, VT privately thinking we might do a fund raising at the reunion. What Howard was to offer shocked me! Howard and Mabel donated a lot in the Daniel and Linda Whipple Dunn family plot. The plot is the burial sites for Dan and Linda, Ellen Croak Dunn and Bernice Dunn....and within 50 feet of the Thomas and Esther Shippee Dunn graves! 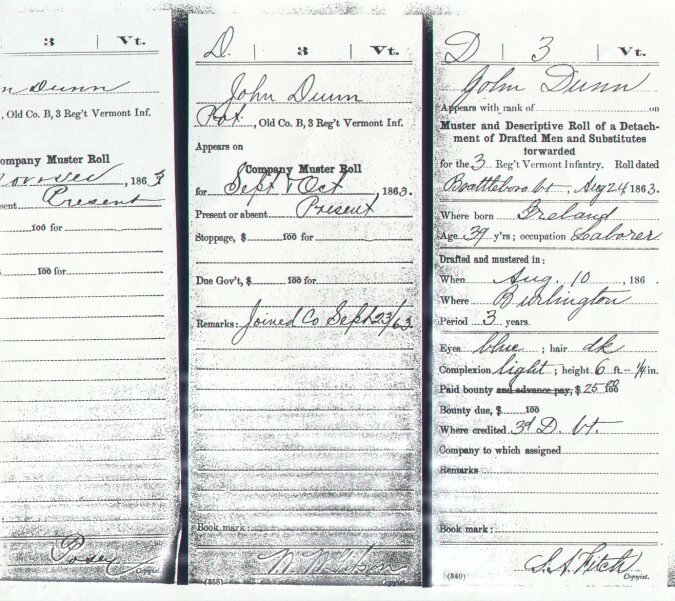 Over the years two of his great-grandnephews Earl Dunn of Dunn-Loring, Va. and Tom Dunn of East Hardwick, Vermont were able to research and document his military record sufficiently to enable the Veteran Affairs Office to provide a headstone. The initial research had been undertaken by a great-grandniece Peggy Decoteau Auger. On 2 May 1998, Thomas E. Dunn of East Hardwick, Vermont submitted an application for a Memorial Stone on behalf of John Dunn to the Veteran's Affairs Office [Form 40-1330]. If approved this stone will be erected on the Daniel Dunn Family Lot at St. Mary's Cemetery in Newport, Vermont. Howard and Mabel Dunn have generously donated this lot. 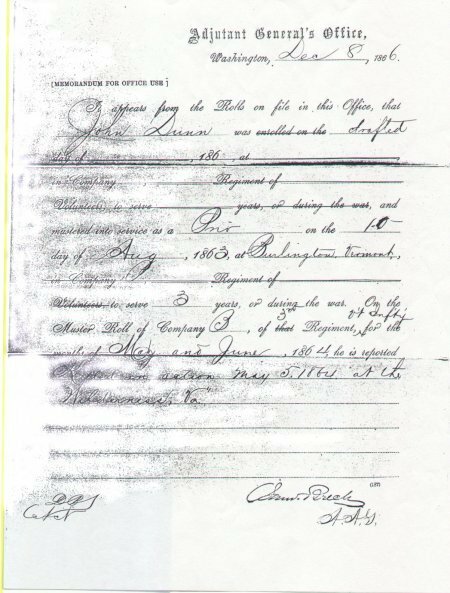 John Dunn was killed in the Civil War, as per the documentation provided. b. That it was a few years after his death that the government finally notified his family. c. Dunn Family Research involving the usual and customary cemeteries used by the family between 1848-1900, research and investigations into the local churches have failed to suggest any evidence his body was recovered or a funeral was held in northern Vermont. d. The Dunn Family is most anxious to erect a memorial to this young man who gave his life to his country and we certainly would appreciate any assistance you might afford us in processing this application. 1998 marks 150 years since the Dunn's arrival in America from Ireland. On 24 July 1998 I called the Veterans Affairs Office and discovered the application had been approved and the stone would be delivered to my home within 90-120 days. The headstone is an upright white marble stone, 42 inches long, 13 inches wide, and 4 inches thick. It weighs about #230. It is engraved with his name, rank, unit and date of birth/death with a Christian cross at the top. On Thursday, 22 October 1998, the Garon-St. Sauveur Granite Company on Union Street in Newport called to say the stone had been set. [Costs: $95] Mission Accomplished!!! The blessing of the Stone ceremony was a most spiritually inspiring event. Father Leo Bilodeau conducted the ceremony. The Liturgy of the Blessing of the Stone was very beautiful and made very personal by Father Leo. Father Leo was greatly appreciated for his contribution and his message of hope. Earl Dunn, who has restored the James C. Dunn Family Bible offered readings of handwritten entries made by James C. Dunn himself describing John's arrival in Vermont in 1852 and his death at Wilderness, Va.
Earl Dunn's fianc�e, Linda Fisher, a southern lady by birth and residence, offered a reading that accompanied a red, white and blue floral arrangement [appropriately nestled in a bed of green foliage] sent by a friend who is a Southern Civil War Historian. by a fellow American in defense of his. May we always be worthy of their sacrifices. This was given as a symbolic gesture of reconciliation between Virginia and Vermont and a greater need for reconciliation of all people. Her comment that "no war is civil" and subsequent comments certainly reminded us of the frailty of our nature and our duty to God and Country. It was a beautiful thought and very appropriate in the moment. Earl Dunn, a retired Colonel of the United States Army, and Linda had ventured to Wilderness Va., and located the exact site on the Battlefield of the Third Vermont defense in May 5th, 1864. This was at the junction of Brock Road and Plank Road. In the woods off to the side of Plank Road, Earl and Linda procured a small sampling of the earth of Virginia and had brought this to Newport. Howard Dunn and Peggy Decoteau Auger, grandnephew and great-grandniece of John Dunn, sprinkled this earth around the headstone. There was not a dry eye at St. Mary's Cemetery on this morning. We were most fortunate to have with us two members of the Vermont Hemlocks, Tony Pare and Whitney Maxfield. The Vermont Civil War Hemlocks are a Vermont volunteer group dedicated to preserving the history and tradition of the Soldiers of the Civil War. Tony and Whitney, Privates of Co. A, 3rd Vermont Regiment, served as Honor Guards for the Reenactment Ceremony. 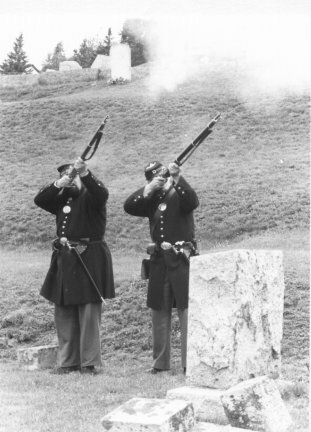 Dressed and out-fitted in the uniforms of authentic Civil War "Blue", armed with vintage muskets and standing at attention beside the beautiful white marble headstone, their presence certainly captured for us the importance of the moment. Once again this was a most compelling addition to the ceremony and arranged by Earl. As a final act of Dedication and Consecration the two members of Vermont's 3rd Regiment, Co. A, marched in cadence just off the Memorial site and gave John a military style Salute with three volleys from their muskets. John Dunn is home�in Spirit if not in body and his act of bravery, courage, and sacrifice to his newly adopted country will henceforth be remembered. Contributed by Tom Dunn, Earl N. Dunn and Peggy Decoteau Auger. Note: The stone was actually crafted/manufactured at GIV [Granite Industries of Vermont] in Barre, Vermont, 1/2 mile from my office and barely 32 miles from my home, about 75 miles from Newport! The finished stone was trucked to a warehouse in New Jersey, shipped back to a warehouse in Mass., then here to East Hardwick, Vt. ... possibly 900 miles to get to its destination thirty miles away!